A 1974 invention is getting a very inclusive makeover. Kristen Sharpless had an interesting assignment for her Intro to Vision Rehab Therapy class. The graduate student from the University of Massachusetts was assigned to create an adapted recreational game for someone who is blind. In a flash of inspiration, she created a Rubik's Cube with tactile inputs so people with limited vision could still use it. She posted the prototype on Reddit and immediately received an outpour of positive comments. "I really liked about how much traction it got and the fact that I could spread awareness that adapting anything is possible if you think hard enough, and that even the most uncreative person (myself!) can think of something that somebody else could find really helpful," she told Mashable. "I’m not a terribly creative person (which is why I’m shocked this became so big), so when I saw the Rubik’s Cube, I was thrilled when I knew immediately what to do with it," she said. "I had my best friend in mind (she’s not blind, she just loves playing with these things), so I thought I would make it tactile and blindfold her to have her try it out!" The Rubik's Cube took her ten minutes to make and cost less than $15. She took an original cube and changed it with items she found in Michael's. The only challenge was finding different textures, but overall she designed each side to make it easy for everyone to understand. It took her 10 minutes to make and cost less than $15. "I wanted to share something that was cheap and easy to make so people who work with the blind/ have blind friends or family could replicate it if they wanted," she said. The 29-year-old student chose the program to work with individuals who are blind or deaf and help them "navigate through the world and live as independently as possible." Sharpless mentioned on Reddit, she wants to "work with the Helen Kellers of the world." "I have spent my entire educational and professional career immersed in the DeafBlind community," she told Mashable. "I would love for the opportunity to give back to a community that has given me so much." 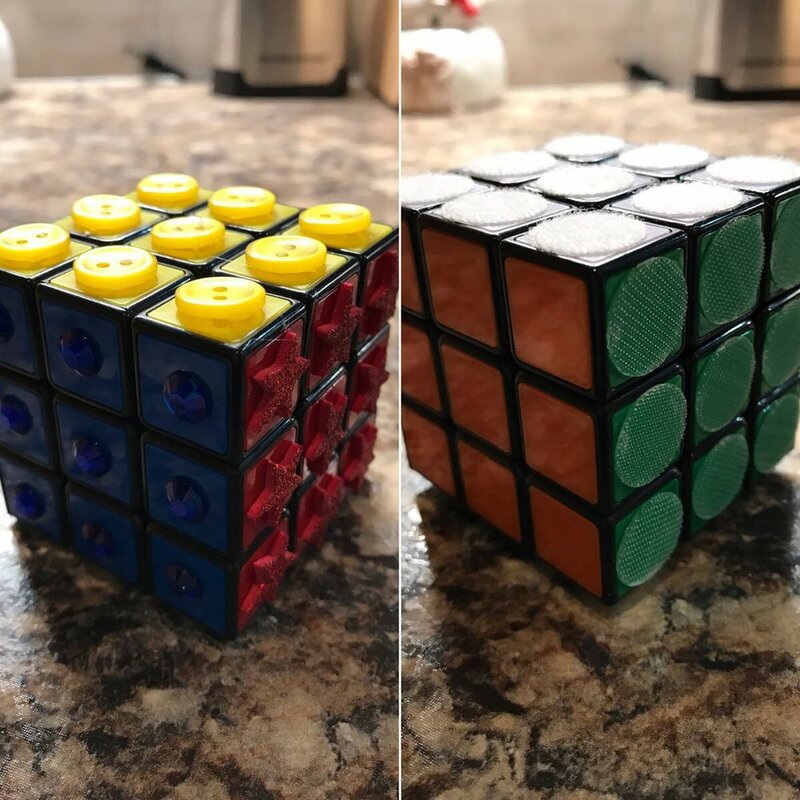 Now, a Rubik's Cube for the blind has been done before (of course Redditors had to let her know), but she decided on creating a new look on the traditional toy. As a result of her Reddit post, people began sharing personal stories and praising her for providing a product with blind people in mind. "What's awesome about [the two Rubik's Cubes for the blind] is that they all serve the same purpose - to accommodate the needs of people who are blind - but they all take different approaches, which is great because no person - blind or sighted - is the same and has the same needs," she said. She has no plans of making more of the project or selling them, but she did learn a lot about herself and the impact one object can make for people with disabilities. The Valk 3 Power and Power M are here!